Just got another kit back from a huge (100-200 people!) 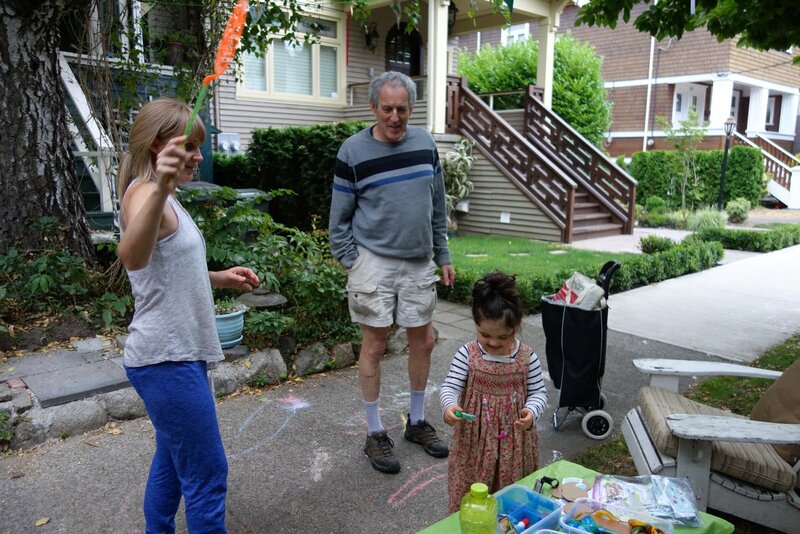 block party in Kerrisdale. Well done! 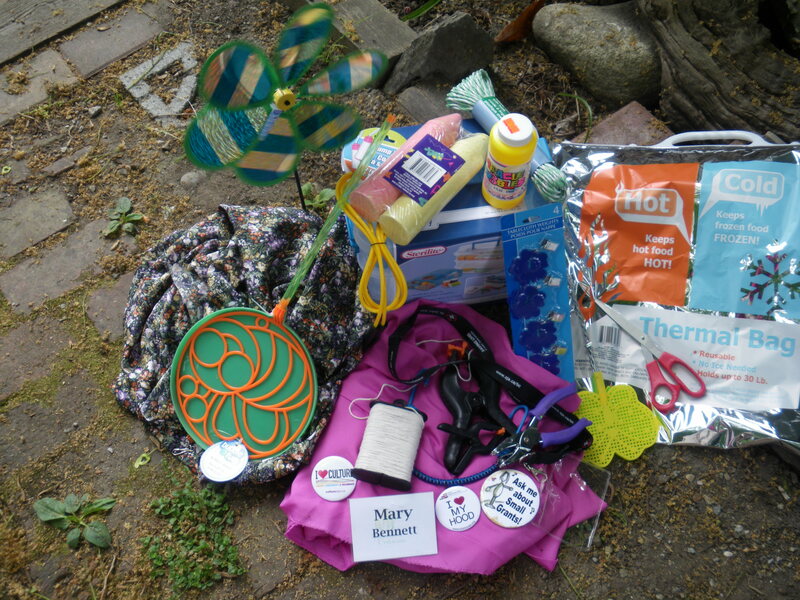 and the organizer has added stuff to it including a bag of rags for cleanup of art projects. Good call! I have two here at home now so if you’d like to borrow one, just drop me a note maryinvancouver@gmail.com or make a note on facebook Mary Peterson Bennett. Click the “Block Parties” category if you want to see photos of the kits and a list of contents. We have 6 in total and like it if you hold on to it for a while. (I can usually arrange to meet you at Kits House at the community potluck -3rd Wednesday- the market (Thursdays) or art drop-in on Tuesday nights – but check with me first, ok? 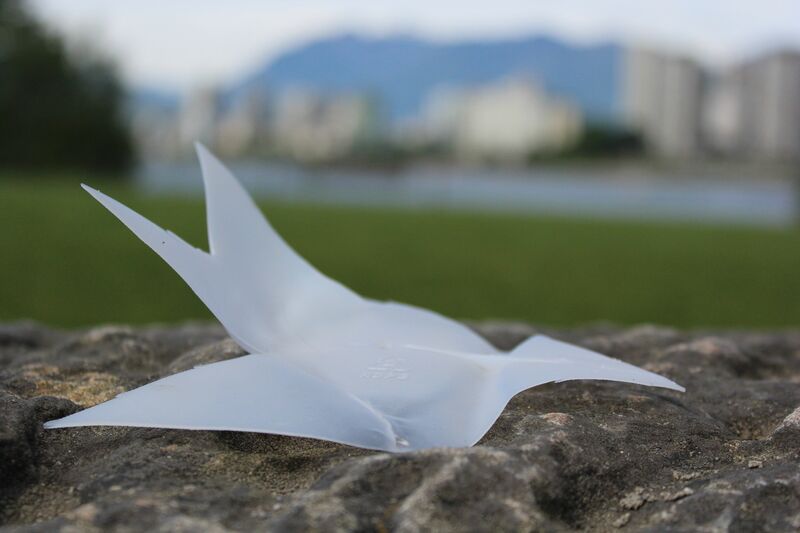 3 plastic reusable table cloths – one meant for crafts – we encourage you to have your guests sign and return. Block party at 2600 Block West 7th (Trafalgar to Stephens). So we have our 6 block party kits and they’re roaming around the west side having lots of fun at parties. The new version cart uses these carts – 4 are like this; 2 are the other version. These hold a lot and are more flexible as things c an extend. As time goes on we also add things. Kit #1 now has tie-dyed bunting/flags and also green bunting/flags that say “block party” as well as fabric, rope and clothes pegs to make your own. 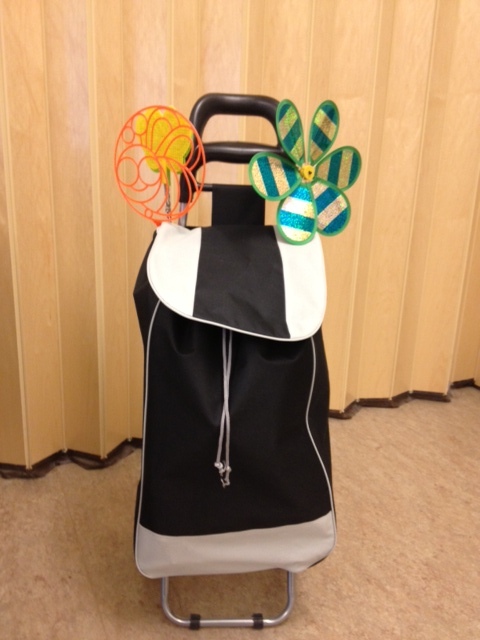 Good times to borrow or return a cart are the 3rd Wednesday Potluck at Kits House or the 3rd or 4th Tuesday. Most people then just keeps the cart till it’s booked but if you don’t have space you can return it. 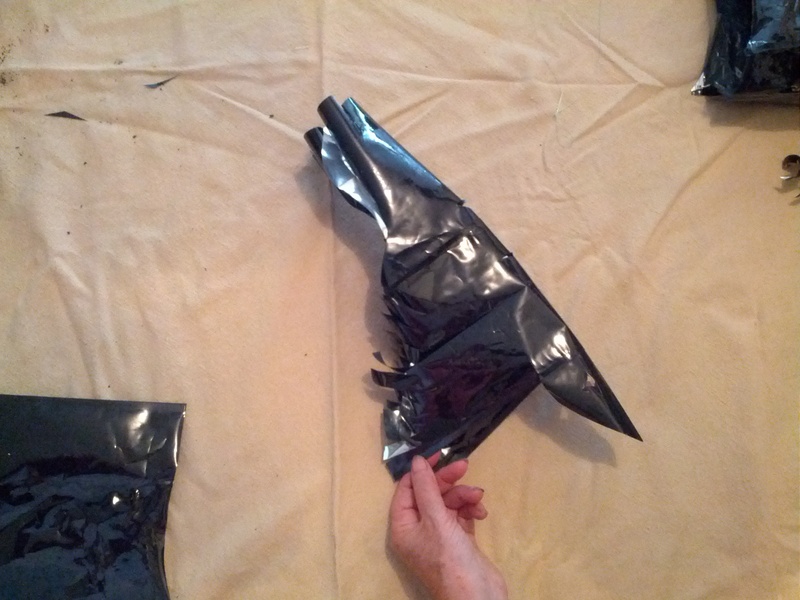 Joanne and I are having fun sending our kits off to parties. It’s as if we’re going ourselves and appreciate your sending photos. As we develop the 6 kits, some get additional stuff. and additional table cloths beyond the basic 3.
plastic re-usable items that you won’t be using (some people buy extra plastic stuff and don’t use it all). We don’t *need* it – so please don’t give us stuff that you yourself would re-use: just if it’s otherwise going in the landfill! Let us know which items you most appreciated and if there’s more of anything you’d like, we still have a bit of the budget left!! Joanne and I have been talking about a lot of different options of providing bunting (little flags) for our block party kits. The time to make ’em, how to store ’em, etc. has been a tad exciting but overwhelming. Problems like: how long do they need to be; what to provide so people actually put them back in the kit to be used again, what if they get wet, etc. etc. etc. We loved the idea of tie-dye bunting but don’t have the time to tie-dye, sew etc and then there are the other problems see above that remain unanswered anyways. 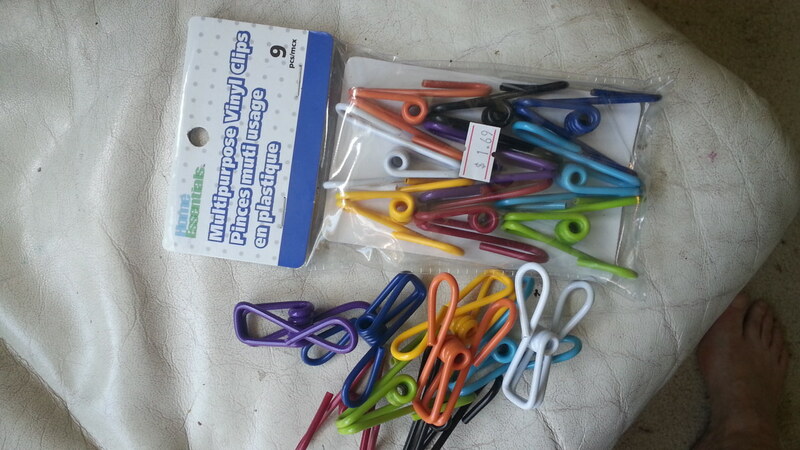 So I saw these great colourful clips at a dollar store and now thinking we’ll provide clips and rope and suggestions on DIY bunting ideas that can be done right at the party. Could be tie-dye. Could be paintings on fabric or paper. Could be ripping strands of sparkly fabric. Could be magnolia leaves. THE POSSIBILITIES ARE ENDLESS. btw Balloons are bad. Especially helium balloons. I know they’re lovely but there are other options. If you truly must use balloons, you might want to read this article that is pro-balloons but provides some interesting comparison information. 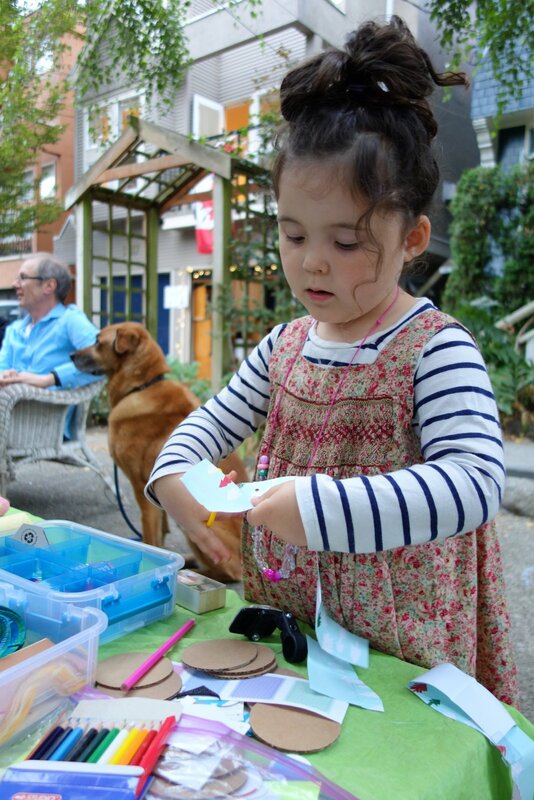 We got a #neighbourhoodsmallgrant to put together kits for block parties including (ta da!) bubbles! As this is a Greenest city grant it’s all about encouraging people to reuse and recycle. So we’ve bought some jars of “starter bubble solution” but are going to make our own for refills. The secret ingredient appears to be glycerine which can be bought in the first aid section of your local drug store. Although I’ve been warned that it stains clothing. So don’t wear your work clothes for bubble parties. And for dishwashing liquid to use Joy or Dawn (makes you wonder what’s in those two products that’s not in eco-friendly dishwashing liquid like Seventh Generation). Some recipes call for sugar or light corn syrup. 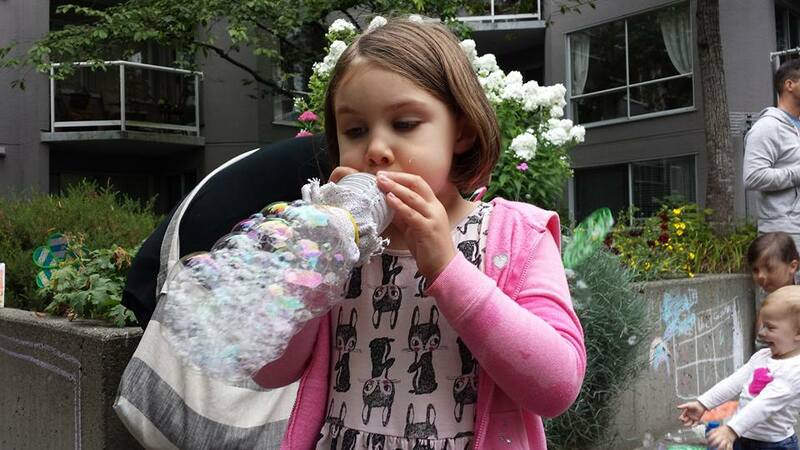 The secret trick is to let it settle overnight to make better bubbles. Also experimenting with cutting the bottoms off plastic bottles to use as wands. We got foiled a bit – Urban Source was closed so we couldn’t buy the recycled cardboard and materials for the name tag kit. 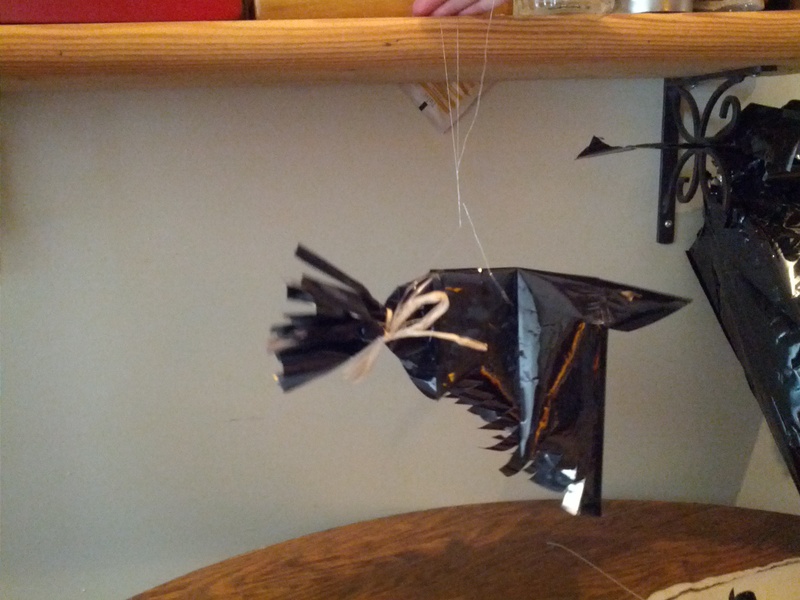 And we *really* want to provide bunting (little flags) and we still need to buy more table cloths, but the prototype is ready for a party. name t ag kit – 2 pairs of scissors; 4 glue sticks; one bottle liquid glue, pencil crayons and pencil sharpener ; and of course glitter. Trying how best to put the pinwheel and the giant bubble wand into the cart without crushing them, we realized the obvious – just put them on the outside. Besides the final supplies mentioned, we plan to paint the carts… Stay tuned. 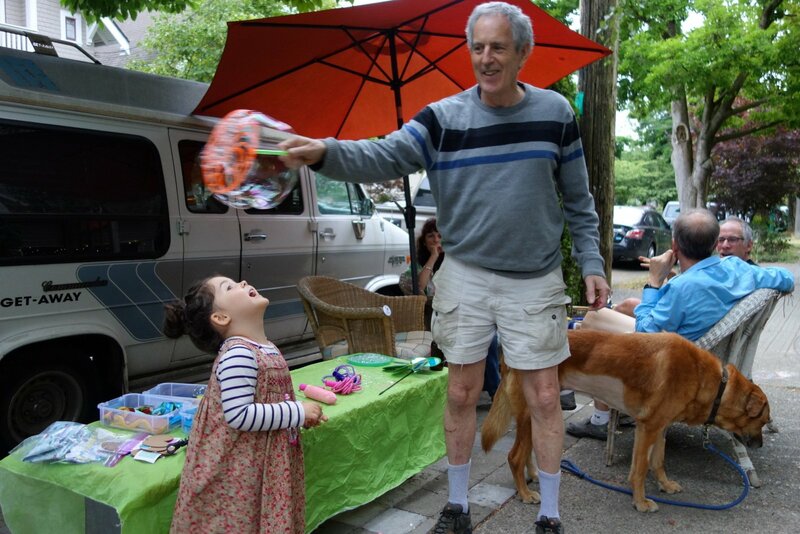 We now have t wo booked for June Car Free Days block parties – there will be 6 available by June 16-17, so we still have four available to be booked. 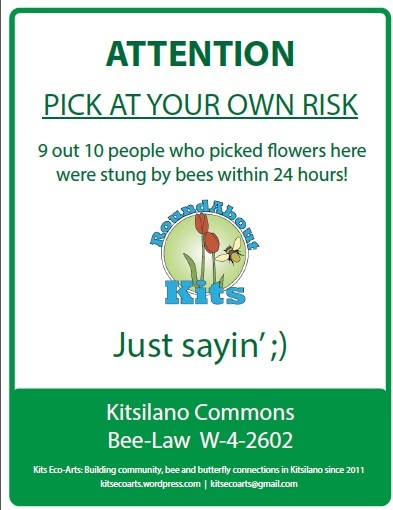 Let us know at kitsecoarts@gmail.com and then pick up from Kits House. 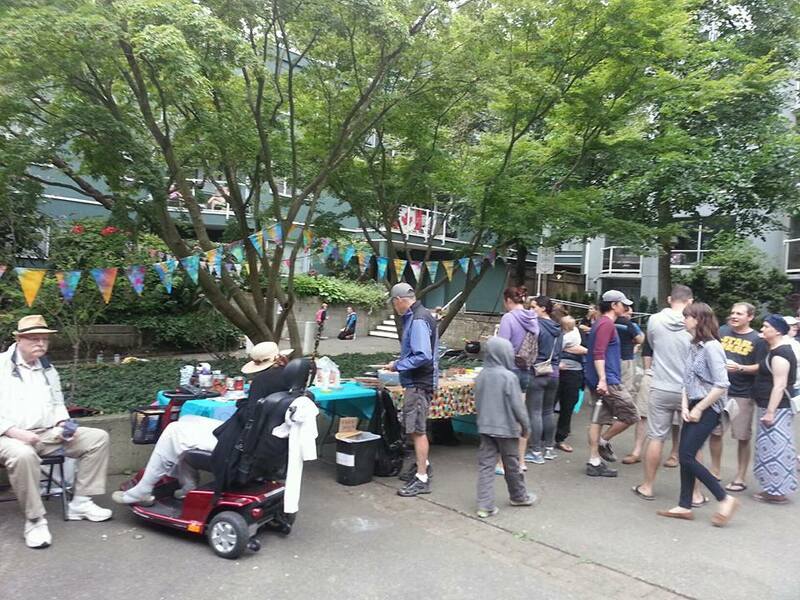 We’re also imagining a Kitsilano Trivia game and a list of tips to make your block party greener. And maybe a simple first aid kit – just bandaids of various sizes. Thanks to Vancouver Foundation’s Neighbourhood Small Grant program and Kits House for support for this project. 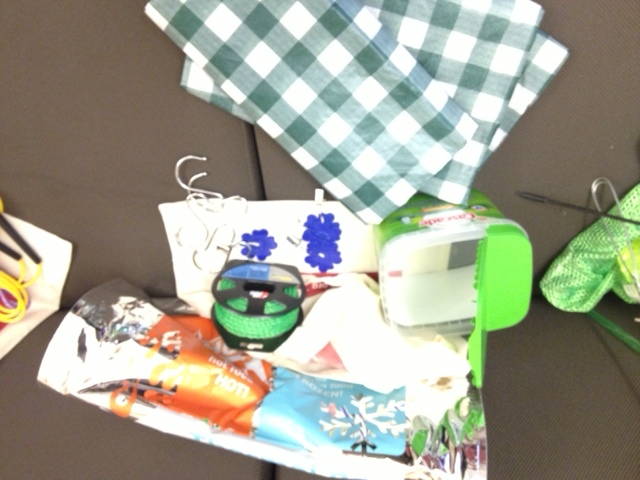 Some of the items you can expect in your block party rolling cart. Thank you to the Vancouver Foundation’s Neighbourhood Small Grant Program and Kitsilano Neighbourhood House for support. 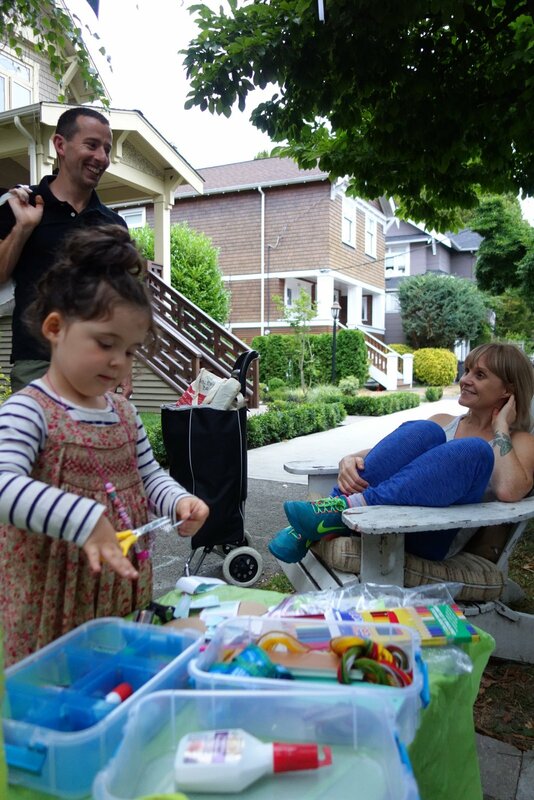 We’ll have the kits ready before Kitsilano Car-Free Days, and, yes, you can book yours now and pick up the week before by arrangement – either Tuesday or Wednesday night at Kits House preferably..